I love to see my scrolls used on site. Click the link to see! These two kakejiku are going to a Judoka in Malta. I really liked the mellow color of the red. Jita Kyouei and Seiryoku Zenyo are the two themes of Judo set by Jigoro Kano. I love the way this semi cursive calligraphy by Yoshimi Yamada Maples is both strong and subtle. 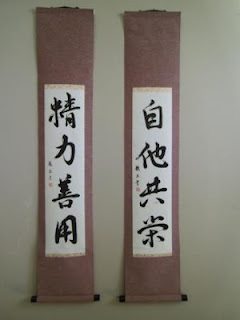 The scroll is completed with black plastic jikusaki and a Navy Hanging string. Dimensions provided at a later time. This scroll is going to Canada. It has a family crest assigned to this individual by Japan. 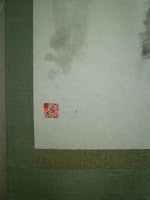 The writing says Kuppuku Suru Bekarazu. Never surrender is the meaning of the phrase. This was drawn and written by Natsuko Horinouchi. It is hard to see, but the cloth has white raised interwoven lines over the grey. It is very beautiful. The Ginran has a silver on green. The hanging string is Takuboku (white with green and black fleck) and the jikusaki is made of ivory plastic. It is a very beautiful scroll. This wallscroll was an order from a return customer. This black cherry blossom cloth was very beautiful. That is why I chose to purchase it. The kireji (cloth) has been in my inventory for almost 4 years. I am very happy that someone selected this cherry blossom cloth for their kakejiku. The scroll reads Mujou. Mu 無is infinite or nothing and Jou 常 and is the ideal of Impermanence or Transience in Buddhism.The Japanese calligraphy was written in the Gyousho or semi-cursive style s or Yamada Maples. I think this is some of Yoshimi’s best shodo. The scroll is finished with a Shitan or Rosewood jikusaki and a purple with gold trim pattern hanging string. This picture of a brook or rolling stream was the one finally selected by the customer from the American Bonsai Society Convention in Denver Colorado, as the final piece they wanted to use. This sumi-e painting was also done by polish artist Mariusz Szmerdt. I am amazed at how the water comes alive in this simple painting...It is not easy to accomplish the movement of the water in such a medium. The customer wished to use a rich brown earthtone cloth. 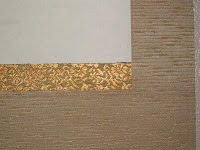 I selected a Gold on Green ichimonji and the Kodai San Iro kakehimo which has a gold hue with flecks of green and black. The jikusaki is an ivory plastic piece. This was another variation on the waterfall. It was completed by Mariusz Szmerdt, polish artist. He can be reached at http://sumi-e.home.pl/contact/ This waterfall has more detail than the previous one, but it still focuses on the detail in the water rolling off the rocks, but I purposefully asked the artist to not add other vegetation to compete with a bonsai or Sanyasou in a display. This has a little higher quality cloth silk with a beautiful flower arabesque. When looking from far away it melds together like flowing water. 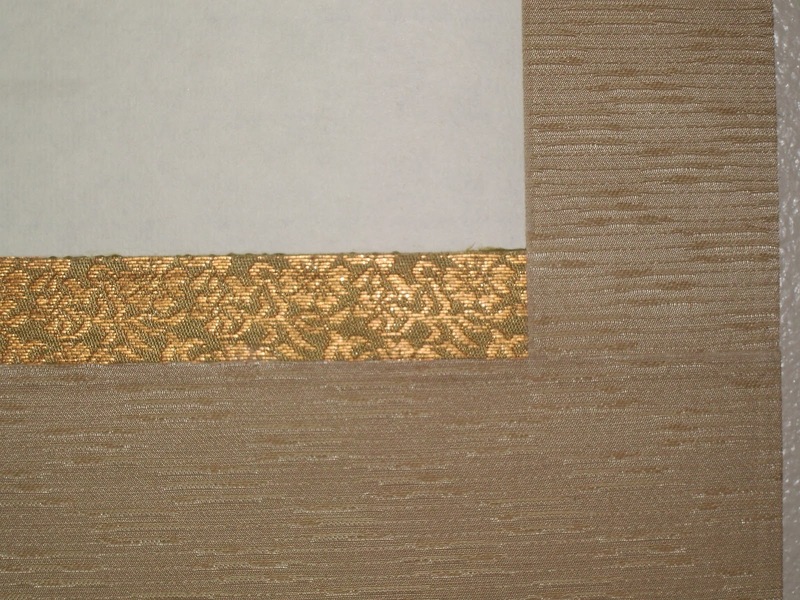 It is completed with the Shibucha stained wood jikusaki and a Kodai San Iro kakehimo. This scroll is for sale. 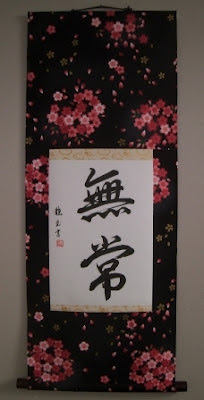 If you would like to purchase it please send an inquiry to sales@customjapanesecalligraphy.com or call to 801-785-0919. This Kakejiku was part of a commission that the person buying wished for something else. However, as I look at this, this is definitely what a bonsai waterfall scroll should be. Simple, minimal and helping to place the bonsai in the natural setting. This painting was done by a Polish artist. I have great appreciation for his talents. He is also a diligent and inspired worker. You will see this as we go through 3 sets of waterfall/rill paintings until the final was decided upon. This one I think is actually the best for bonsai display because it is very subdued to the eye, but still clearly conveys the water gushing down the cliffside. 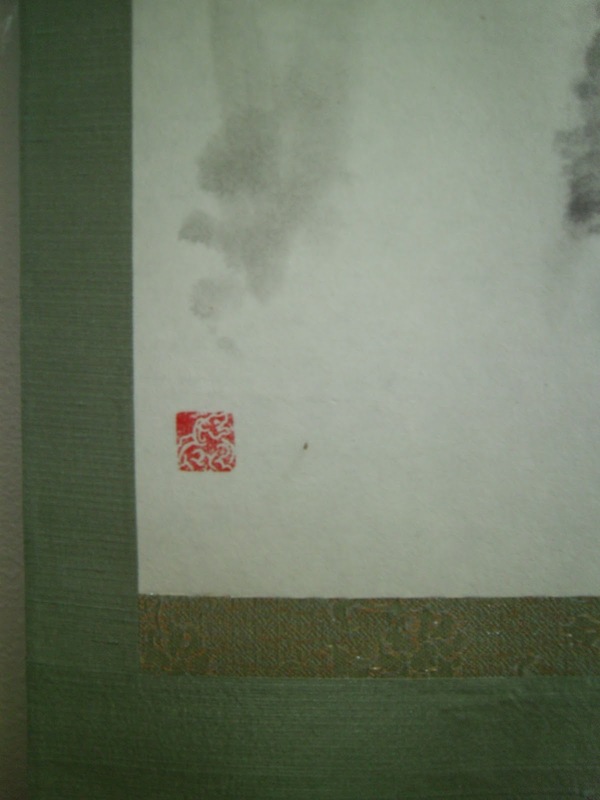 The scroll is done in a Sandan Hyougu styling. I selected the Ichimonji (Flower Arabesque) to blend into the Chuumawashi (blue cloth) and provide the imagery for the water of the waterfall. Next I selected the a goldenrod to represent the sun. It is completed with a 9 Bun plastic ivory jikusaki and Kodai Saniro Kanging string. This was an order from the ABS/BCI convention in Denver Colorado. I had shown a picture of a distant mountain, but this individual wanted 3 mountains instead of one. Additionally, they wanted a little more Western feel to it. They had a difficult time selecting the cloth but they wanted a gray. I thought the faint lines in this cloth could either represent fog or flowing water subconsciously. He agreed. It is finished with an ivory plastic Jikusaki and the Light Gray (Nezumi Iro) Hanging string. I do not know what bonsai they will ultimately display with the scroll, but I feel it is versatile enough to go with many different evergreens in a variety of different stylings.